Den mystiske Gatsby är tillbaka! It was 1922. Prohibition, alcohol, and excess. Jay Gatsby’s Mad Mansion was known to be haunted by a kaleidoscopic carnival of every walk of life. Film stars, gangsters, governors, Broadway directors, high school dropouts, morality protectors and scandalous showgirls. When Jay Gatsby invited for Friday, the 12th of January, every corner of Gothenburg, spilled through his approaching doors. 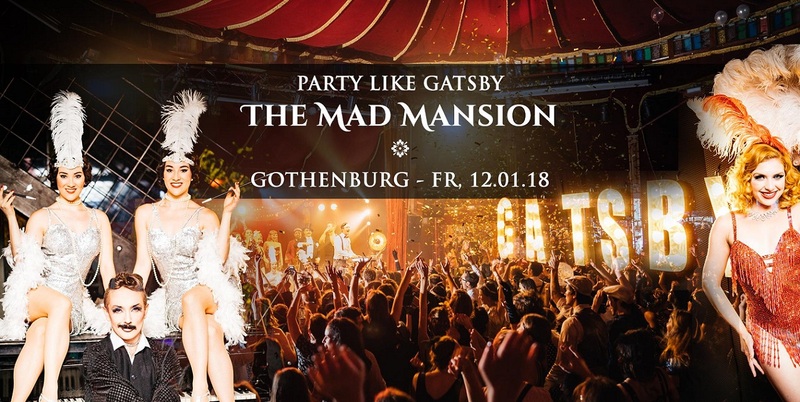 Party like Gatsby presents ’The Mad Mansion’ – an immersive show & party, unlike anything you’ve ever experienced, visiting more than 15 cities. For four years Jay Gatsby, and his entourage of extraordinary artists, has been dazzling guests across Europe. Let magic spark and be paralyzed of happiness. Dress up in your finest attire and lose yourself into a fascinating world of roaring twenties madness. Only one question remains. Gothenburg, who is this Gatsby? Fast Track och Early Bird finns nu till försäljning! Regular Tickets släpps den 24 november!